Kids, Cows and Grass: Do you know where your cows are? Record keeping is not my idea of of fun. I'm sure you know what I mean--tied to the computer for hours, tracking every little penny spent on food, upkeep of your house, and vacations, filing receipts and entering data into spreadsheets so you can see where you spent your money and how to report it to Uncle Sam. Well, frankly, my husband does that record keeping for our family. But I am in charge of all the information about our cattle. That includes what medicines and vaccines were given to which cattle on a certain day, tracking cows and their calves and being able to identify which bull sired a calf, and even where each and every cow is on my ranch every day of the year! The most important part of all that record keeping is not a computer, but the ability to identify each cow. Remember, all of my cows are black! So to a stranger, they all look pretty much alike...and even to me--I can't remember the exact hair texture and style of more than 500 cows! We use a couple of important identification tools to keep track of our cows. First, we put a tag in their ear as soon as they are born. It causes slight annoyance to the calves, but no more than an ear piercing would cause me. 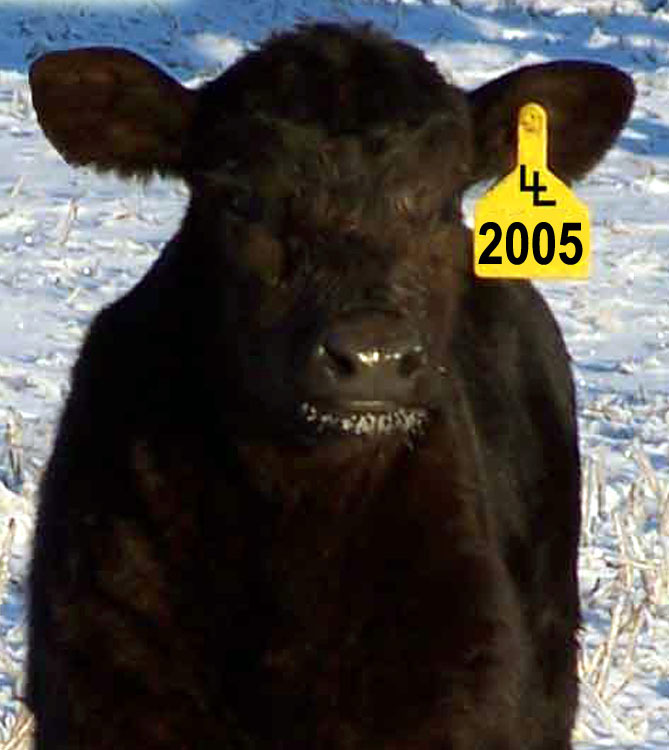 Each cow, bull, steer and heifer on our ranch has their own identification number for their lifetime. As they grow and interact with us, they often earn a name as well. Those names may are usually indicative of their personality: Bessie--for a calm quiet heifer, Rambo--for an aggressive steer, Dipstick--for an ignorant cow who refuses to walk through the working chute! I digress...back to identification numbers! The large number on each tag is that animal's permanent identification number for their lifetime. I also like to write the number of their sire and dam on the tag. But sometimes tags can fall out of the ear, so we must also put a form of permanent identification on every animal. According to the American Angus Association, that must either be a tattoo in their ear, or a freeze brand. For years, we tattooed their permanent number in each animal's ear, but if they lose their tag, you must put them into a working chute to hold them still while you clean their ear to be able to see the green 3/4-inch tall numbers tattooed. So we have been freeze branding their ID number on their side for many years. Read about freeze branding and how we do it in a previous post. This makes a permanent way to identify each and every cow on our ranch. You can see a freeze brand on a heifer's side in the first photo above. It is a large number that is easily seen on black cattle from a distance. Another important tool in the record keeping toolbox for me is my "Red Book." This is my pocket sized book of everything that happens on the ranch...I write down everything while I am outside and when I get back into the house and have time, I transfer all the information to the computer to either a spreadsheet or a database program for the cow herd. I am never without my Red Book. It is always in my pocket along with my lipgloss...here is proof! Every day we work hard to keep track of every penny spent on the ranch--not only for financial purposes, but also because it is important to know which animals have grown well, which ones have been sick, what vaccines they were given and which calf is sired by which bull. A rancher's record keeping system is enormous and we spend many hours a week just keeping track of everything. You may think ranching is all building fence and feeding hay, but it is important to always know where your cows are and what they are doing! Great post! I dont think alot of people realise how much effort we put into keeping track of our animals, their health and their financial performance!